If you could die from an Asparagus overdose, then last week would have been my sweet end. Not satisfied with eating a whole bundle in a day, I proceeded to buy a further 2 bundles and eat them all within 2 days. Can you blame me though? Asparagus is freaking good. What started this Asparagus epidemic you ask? Well Abel and Cole sent it to me 2 weeks in a row, and I just couldn't get enough of it. They also sent me some leeks and I promised to make Daddy Hef some dinner so I mixed them all together with some pastry and goats cheese and this is what happened. It was nice, really, really nice (maybe because I LOVE all of the components) and the next time I get leeks in my box I'm making it straight away! Stick the asparagus on to a griddle on a medium heat with a little salt and pepper and griddle for 5 minutes, then pop to one side. Melt the butter on a low heat in to a sauce pan, then add the leeks and cook gently for around 20 minutes, until softened, then turn up the heat and give them a good old fry until the start to brown a little. Roll out the pastry in to a kind of rectangle, then score 1cm in along each side. Spread the cream cheese in to the boarder you have just cut, then top with the leeks, asparagus and goats cheese. Pop them in to a preheated oven (200 degrees) for 10-15 minutes, serve them straight from the oven with fresh salad and enjoy! Leeks are my absolute favourite vegetable, but asparagus is a close second. 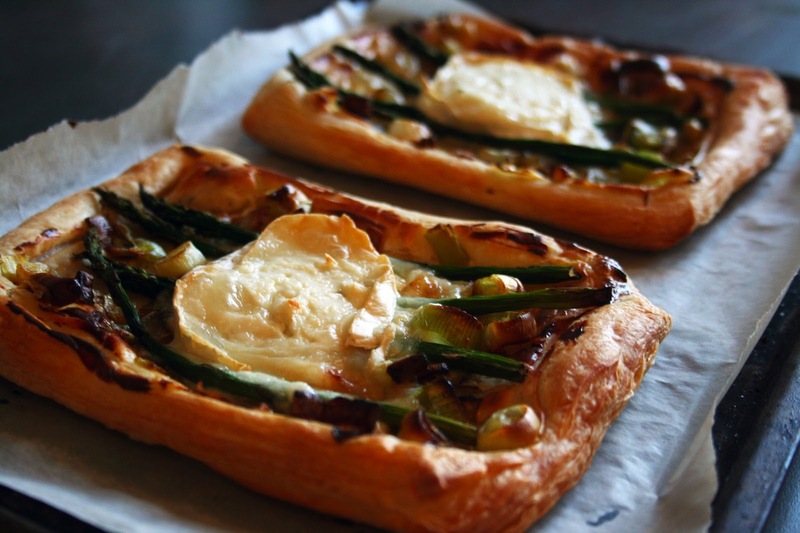 Add goat cheese and pastry to that combination and...wow. I practically licked my screen.